I love getting my pork from Costco - it's generally cheaper and when you buy the tenderloin, you get two in a package. That means, I get to try out two recipes at once. Plus, pork tenderloin is very lean and low fat. 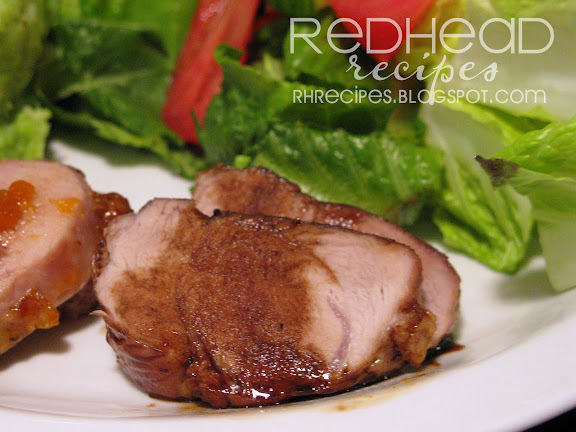 These are my two simple Pork Tenderloin recipes. Bake pork tenderloin at 325 degrees for about 20-25 minutes, or until internal temperature is 145 degrees. Meanwhile, combine vinegar and honey in a small pot, simmer until reduced by half. Remove pork from the oven, brush with reduced vinegar. Place under broiler until sauce is bubbly and starting to caramelize. Remove, turn, brush with vinegar, and repeat. When finished, remove from oven and let rest 7-10 minutes before cutting. Drizzle with remaining vinegar if desired. Bake pork tenderloin at 325 degrees for about 20-25 minutes, or until internal temperature is 145 degrees. Meanwhile, preserves and mustard in a small bowl, microwave until liquid, about 2 minutes. Remove pork from the oven, brush with preserve mixture. Place under broiler until sauce is bubbly and starting to caramelize. Remove, turn, brush with sauce, and repeat. When finished, remove from oven and let rest 7-10 minutes before cutting. Drizzle with remaining sauce if desired. mmm!! 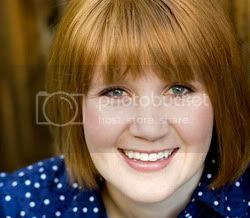 holy crap, sar! your pictures lately have been amazing. Yummy recipes! 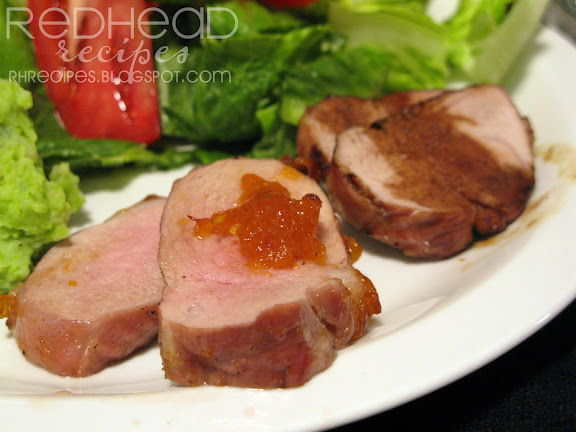 I have a pork tenderloin thawing in my fridge right now for tomorrow...I think I am going to try your balsamic glaze! just a suggestion, usda recommended temp for pork is 160. Cheers. AdamB - yes, you do want it to get to 160 degrees. I hope my instructions weren't deceiving. After it reaches 145 degrees you then put the sauce on and cook it longer.